A conversation on the next table in a cafe in Adachi Ward, Tokyo, today was heard seamlessly drifting into topics of ‘English’, ‘overseas’, and ‘English teachers’. 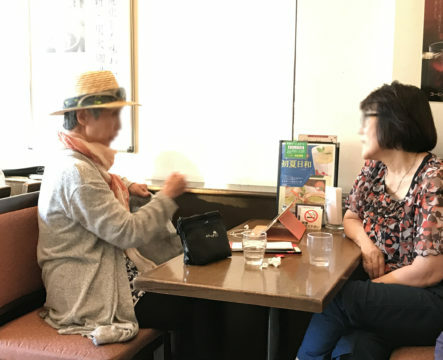 The discussion touched on a variety of foreign themes, but the women were vigilant not to say the terms ‘gaijin’, ‘gaikokujin’ or ‘bakagaijin’ too loud in fear of that gaijin who just walked into the cafe only moments before the smooth transition of topics from ‘rice balls’ to ‘English’. “And then Natsuko said to me, ‘That’s an amazing amount of tuna mayonnaise in your rice ball’ – oh speaking of which, how’s the rapid increase of English usage in Tokyo these days?” said one woman. The two women were quietly confident that the conversation was safely guarded by the sheer complexity of some of the terminology used in their exchange of ideas. “You know I’m really encountering a plethora of bipeds who aren’t exactly from this neck of the woods,” said the other woman.